Maintaining daily dental care and hygiene habits is very important to have healthy teeth and a confident smile. If you are blessed with a great set of teeth naturally, you would want to keep them like that by looking after them or your smile may lose its charm. Yellowing teeth, dark gums and bad breath are extremely unpleasant and a sign of poor dental care. Paying a regular visit to a periodontist in Jenkintown can help you fix your smile. 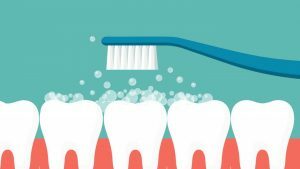 But more importantly, you must adopt these 5 daily habits to keep your teeth healthy and your smile bright. It’s the general recommendation that you must at least brush your teeth twice a day. After waking up and before you sleep. While the morning breath may encourage you to brush your teeth in the morning, many of us neglect brushing our teeth at night. But you must brush your teeth at night too to get rid of the bacteria that has accumulated in your mouth and on your teeth during the day. There is a proper way of doing everything. Brushing your teeth the right way is essential in getting rid of all the bacteria and plaque. Not brushing properly is as good as not brushing at all. Take your own good time in brushing your teeth thoroughly and gently in circular motion to remove all the plaque. Unremoved plaque tends to accumulate and harden leading to conditions like gingivitis. Flossing is very important once a day to remove plaque from the places where your toothbrush can’t reach. If not addressed and removed, this plaque collects and becomes hard. Which then becomes tartar and requires cleaning done by a professional. This buildup can also lead to cavities, bone loss, gum diseases or tooth loss etc. So, keep your mouth healthy and floss every day. Smokers are four times more susceptible to developing a gum disease than people who don’t smoke. In the worst case scenario, people who smoke cigarettes, cigars or pipes etc. may even develop oral cancer as the tobacco in them highly increases the risk of this deadly disease. Even e-cigarettes and smokeless tobacco brands can cause tooth decay and gum diseases. Every dentist recommends that you avoid all tobacco containing products for the sake of youlong-termrm oral health. When choosing a toothpaste, go for a product that includes fluoride in its formula rather than just looking for a pleasant smell and flavor. It is the leading defense against tooth decay. It fights germs, bacteria and forms a protective layer on your teeth. Although, if you suffer from a thyroid related issue, you may want to consult your doctor before using it as it has come under scrutiny for its impact on some areas of health. Looking for a periodontist in Jenkintown for a checkup? Contact Barry Levin DMD and make an appointment today.